The Moroccan organization against hatred and racism has called on all Moroccan citizens to gather in front of the memorial for the May 16 victims in Casablanca, commemorating the second anniversary of the terror attacks that killed 45 people, including the 12 suicide bombers, and injured a hundred more in 2003. Berraoui added that the state, the political parties, the intellectuals, and the media did not do their jobs properly in fighting terrorism. Berraoui said that his organization is doing its best to fight fundamentalism, a major source of terrorism. He added that extremism has no place in the Moroccan society. Parallel to the gathering which will take place on Monday at 6.30 pm, the organization had also organized on Sunday May 15 a special 'night for coexistence' devoted to children from different faiths (Muslims and Jews) at the Jewish Museum of Casablanca. Abdelnabi Dachin, member of the Association of May 16 Victims, regretted that the May 16 commemoration had become an occasional event. Dachin said that in order for these attacks not to be repeated, the state and society should play a more vital role during the whole year – not just occasionally to fight terrorism. They should start from school and home to teach people the principles of tolerance, coexistence and peace. Dachin also criticized those who spread extremist ideas among Moroccans through dirty politics. Mohammed Darif, a Moroccan political analyst and expert in Islamist groups, told Morocco Times that terrorism is not a usual practice in Morocco. “We should not forget that the suicide bombers in Casablanca were under the influence of the Salafia Jihadia that came from Gulf countries. This 'Self-sacrifice' concept has its origin in the Middle East, particularly in Saudi Arabia since 1991, in response to the presence of the US troops in the Arab Peninsula,” said Darif. “I think we should not link terrorism with Morocco because terrorism is not an intrinsic part of the Moroccan society. However, there are some Moroccans who belong to the Moroccan Islamic Combatant Group that emerged in the late 1990s, apparently drawing on Moroccan jihadists who had fought or trained in Afghanistan. This group is trying to influence some desperate young people to sacrifice themselves in the name of Islam,” he added. The GICM has allegedly been associated with major terrorist attacks in Casablanca in 2003 and in Madrid in 2004, respectively with its offshoot Salafia Jihadia being blamed for both. “Most of its members are not Moroccans. Moroccans are used to implement the attacks, but the planners and the sponsors are usually from the Middle East,” said Darif. On May 16, 2003, five sites in Casablanca were targeted, including the 'Cercle de l'Alliance Israelite', a Jewish community centre; 'El Positano' restaurant, owned by Jewish Moroccans; La Casa de España; Hotel Farah; and the Jewish cemetery. 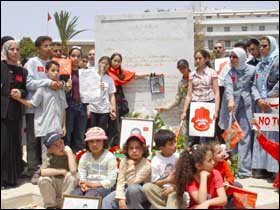 On May 20, 2003, about two million Moroccans demonstrated to give a lesson to the world, condemning terrorism. Men and women, Muslims, Jews and Christians, Berbers and Arabs, children and the elderly marched to show how tolerance and coexistence are experienced in Morocco's daily life, saying with a loud voice No to Terrorism. It was one of the most momentous acts of courage Moroccans have shown in modern history.